Display and alignment tools have only one other window in addition to the image window. A graph window can be created by hitting the "g" key or by clicking on the "g" text button. Graph types include projections through the data (x,y,z,time) and a histogram, with the time graph being the most useful one. If more than 10 points are loaded in a single file, or in a group of files (>= 10 points per file), then a GLM will be applied to the dataset with one baseline per file. Alternatively, 1st or 2nd level GLMs that are used in the jip tools can be integrated into the display, including both maps and time series, as shown by the examples below. 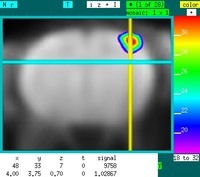 For time data, the graph will show the time series for the voxel at the location of the crosshair on the image window. When an overlay is drawn on the image, this region of interest takes precedence over the crosshair, and the time series shows the average for all voxels within the ROI. If there is no ROI and the cursor is removed, then the time series corresponds to the value at the location of the mouse cursor; such rapid updating as the cursor moves can lead to eventual memory problems, so this method should be used seldom. A projection along y showing gray-scale and overlay signals.